An assault on the San Onofre Nuclear Generating Station (SONGS) spent fuel pools (SFPs) buildings depends on the availability of rocket launchers and the people who would use them. Such a dangerous scheme, however remote but a possibility, would also have to have a motive. All three conditions are present at San Onofre. Rocket launchers are available on both sides of the border, terrorist attackers are for hire in America and Mexico, and a range of motives includes jihad and anger at the U.S. government. Rocket launchers are common enough on American streets that in January one showed up at a Trenton New Jersey gun buyback program held over two days. The fired weapon appeared to be an AT-4. Earlier in January, at another police buyback in Seattle Washington, a far more advanced shoulder-fired rocket launcher showed up to be exchanged for $250. A fired and now-empty Stinger rocket launcher mystified the police who said they would investigate whether it had been stolen or not. Rocket launchers have no place in neighboring San Bernardino County either according to the San Bernardino Police Department. A Vagos motorcycle gang takedown of its upper echelon September 29, 2011 resulted in the seizure of meth, cocaine and hundreds of weapons including an AT-4 rocket launcher and an anti-tank gun according to the San Bernardino Sun. California Attorney General Kamala D. Harris’ office said the Vagos gang was a transnational criminal organization operating in the U.S., Mexico, Puerto Rico, Canada, Germany and New Zealand. The threat of unaccounted for rocket launchers floating around isn’t just a danger on this side of the border. Mexico’s drug lords have been loading up on heavy weaponry including narco tanks and their own arsenal of rocket launchers according to multiple media stories. Time magazine reported “three Soviet-made antitank rockets complete with an RPG-7 shoulder-fired launcher” were seized by a Mexican SWAT team from a drug lord near the border town of Piedras Negras across the Rio Grande from Eagle Pass, Texas in 2012. The rockets, which can reach up to 3,000 feet, are not likely to be able to inflict the kind of damage on SONGS’ exposed SFPs as the weapons and seem more suited to tank and armored car attacks. According to Time, “almost 100,000 guns seized at Mexican crime scenes since 2007, 68% have been traced to the U.S.” American guns and cash heads south as Mexican drugs and muscle head north. 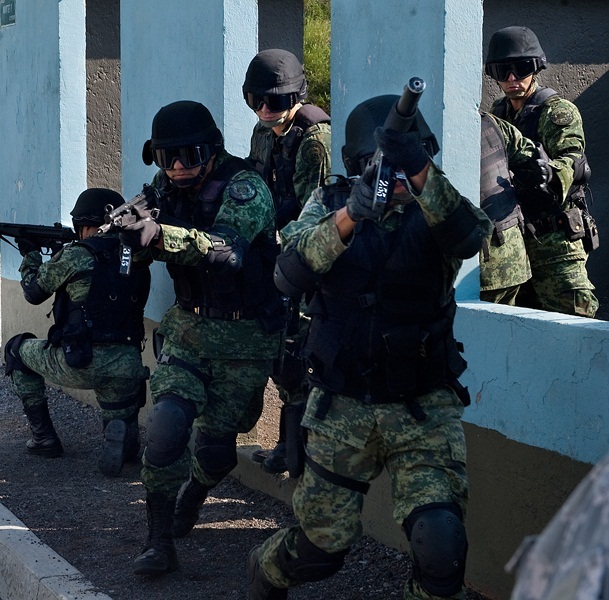 The drug war in Mexico intensified in 2006 when then-President Felipe Calderón’s government ordered the military to take on the narco traffickers responsible for about 90 percent of the cocaine smuggled into the United States. That illicit business, estimated to be worth up to $49.4 billion annually according to multiple sources, has been plunged into a drug war that has resulted in the deaths of between 60,000 to 100,000 Mexicans, many from gruesome beheadings. It also has left Mexico awash in weapons and the violent men that use them. Mexican marines busted nine alleged drug cartel members in Coahihuila last November and the haul was substantial. Heaps of guns, pot, cocaine, meth and cash were displayed under heavy guard. Suspected cartel members stood silent and sheepish behind the arsenal which included 30 rocket-propelled grenade launchers. Could this vast pool of hit men and rocket launchers be used to threaten the United States by its enemies in places like, for example, the Middle East? The answer is yes according to the Federal Bureau of Investigation. The FBI busted a conspiracy in 2011 it says began with the Iranian government attempting to put a hit on the Saudi Arabian ambassador to the United State in this country using Mexican cartel hit men. The agency revealed the plot October 17, 2012 when the lead conspirator, Manssor Arbabsiar, pleaded guilty in federal court in the Southern District of New York to conspiring with Iranian military officials to assassinate the ambassador. The plan was to pay four cartel gunmen $1.5 million to take out the ambassador at one of his favorite Washington D.C. restaurants regardless of the collateral damage. Arbabsiar didn’t realize he was dealing with a wired undercover American government agent when he admitted that he was recruited, funded and told what to do by senior officials in Iran’s Qods Force. This 15,000-strong special unit of Iran’s Army of the Guardians of the Islamic Revolution is responsible for “exporting” the revolution according to Robin Wright’s 2008 book Dreams and Shadows: the Future of the Middle East. The Federation of American Scientists Intelligence Resource Program says that the Qods Force is responsible for the Revolutionary Guard’s “extraterritorial operations.” Several sources say that the elite spy and terrorist network answers directly to Iran’s Supreme Leader Ali Khamenei. A year earlier, a then 26 year old New Jersey man who had joined al-Qaeda tried to shoot his way out of a Sanaa, Yemen hospital killing one and injuring several others before being cornered and captured by Yemini special forces. Sharif Mobley had worked at five different nuclear power plants between 2002 and 2003 including Peach Bottom and Three Mile Island. It isn’t always easy or obvious who the potential fanatic is going to be. The terrorist attack scenarios exposed in EnviorReporter.com’s Black Swan SONGS series are deadly outcomes that must be prevented 100 percent of the time. Destruction of spent fuel rods and releasing thousands of units of intensely lethal radiation into the environment cannot be explained away by hopeful rationalization or dubious statistics. A nation can be brought to its knees by the realistic situations explored herein. It is far easier to prevent a black swan event than it is dealing with its consequences. 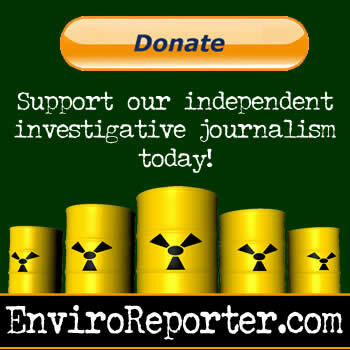 EnviroReporter.com’s revelations are not going to be news to many people familiar with the destructive potential of a terrorist attack on SFPs – international concerns over Fukushima’s Unit 4 SFP has been widespread. 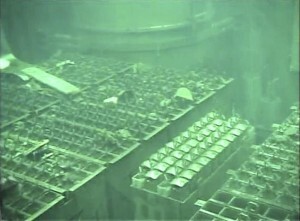 People, including terrorists, cartel members and state-sponsored agents, have a constant reminder in Fukushima of the potential destruction of a spent fuel pool would cause. Companies that own nuclear facilities like San Onofre have no financial incentive to have a robust force on force-ready security setup that would protect the region from an organized terrorist attack. In SONGS’ case, the strategic attraction of targeting the spent fuel pools would include making a huge Marine base uninhabitable. Any country planning military strikes has even more reasons to best know its most serious weaknesses before launching such a venture. 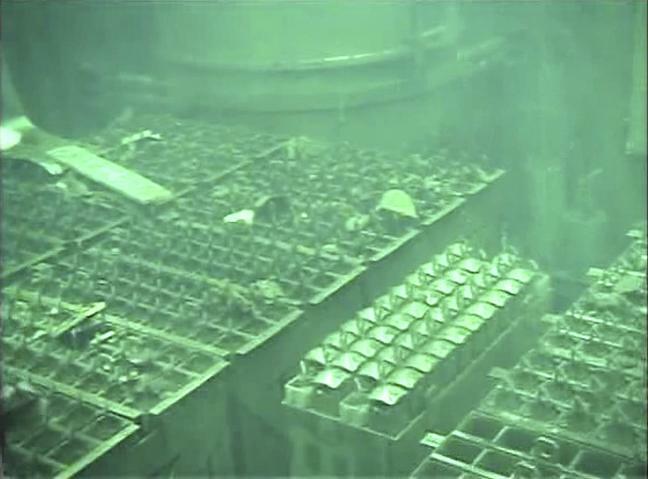 The spent fuel pools at San Onofre and others around the country are just such weaknesses depending on location and a variety of factors. These flaws could be ironed out fairly quickly at SONGS because of its unique military environment. World events necessitate that the nation’s armed forces take these threats seriously. The de-escalation of a possible US-Syrian military engagement does not of course remove the threat of attacks against the United States. Even in light of the phone call between Iranian President Hassan Rouhani and American President Barack Obama during the Iranian leader’s trip to the United Nations in New York City in September, the Islamist country is still singing the same tune. “We support the government’s diplomatic moves including the New York trip because we have faith (in them),” said Iran’s supreme leader Ayatollah Ali Khamenei to commanders and graduating military cadets in Tehran October 5. “But some of what happened in the New York trip was not appropriate,” a thinly veiled allusion to the phone call between the two presidents. The threat of Iranian terrorism is not lessened with words like these. The possibility of State-sponsored terrorism using cartel members with their ties with American gangsters is not something to take lightly. Nowhere in the country is a nuclear reactor complex more vulnerable to a terrorist attach than the San Onofre Nuclear Generating Station. SONGS’s spent fuel pools buildings are vulnerable to enemies of the United States using cartel soldiers as their apolitical terrorists for hire. The weapons and men are available in a land 70 miles away where brutality is law in the raging drug war. Dangerous men are available for a price in drug country – a price Iran, al-Qaeda and other enemies of the United States have the means to pay. Cartel-linked hired guns exist on both sides of the border according to numerous sources. Cartels especially like trained U.S. soldiers according to a FoxNews.com article August 1. A former Army private, Michael Apodaca, was sentenced to life in El Paso July 25 for executing a cartel hit for $5,000 in the border city May 15, 2009. A former Army sergeant who served in Afghanistan was sentenced to 15 years in prison June 21 for a murder-for-hire killing. Last September a former active-duty first lieutenant pleaded guilty to conspiracy to commit murder in Laredo after offering his services to what he thought was a cartel member. 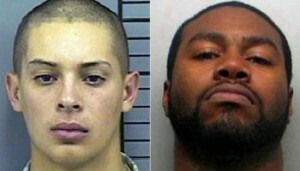 Kevin Corley, 29, from Fort Carson in Colorado offered tactical training for cartel soldiers and to buy weapons for them. Corley discussed military tactics with the undercover agent and said he would rip off the weapons from military posts. After agreeing to a cartel hit for $50,000 and cocaine, Corley was arrested Dec. 23, 2011. Cartels know that the U.S. military has prospective recruits who have gang backgrounds or join gangs once in the service. The FBI National Gang Intelligence Center has identified at least 53 gangs affiliated with the American armed forces. Thank you for having the guts to report this. Maybe the Marines or anti nuke people will see that this threat is real and get off their butts and protect those nuclear rod pools. The U.S. and German defense departments created this security and terrorism studies institute in 1993. Glad to see this part of DOD taking a look at this because defeating the threat is practical and essential. It is a threat on both sides of the Atlantic that can’t be ignored any longer. Sleep well, dream of something pleasant, sheep, perhaps. Just remember, there may be a wolf lurking among them. Or is it a Black Swan? Have your geiger counters fully functioning. This is so shocking I don’t even know where to begin. Actually I do. The wingnuts who have commented so far show just how nuts conspiro’s really are. It’s likely that they couldn’t even understand this monumental work. Enviroreporter has done the job our government should be doing. What I find really impressive is how you covered all the bases showing how credible the threat of attacking San Onofre, Peach Bottom and the other hundred or so pre-placed terrorist targets really is. Instead of just scaring the pants off of us, you’ve also hinted at the solutions which I gather are in the next piece. I can’t wait to read it! Thank you Enviroreporter! You really have done commendable work that is a credit to your profession and our country. Now the government must ACT now that the wingnuts who shut it have been show the door. In the days of old when they dug up the gold, the great equalizer was the Colt .45 Nowadays the great equalizer is RPG. The launchers are actually legal to own in the US, but the propelled grenades surely are not. But, for the right price and the right reasons, Russia, China, etc. could (and do) supply tens of thousands of these “great new equalizers” to pretty much anyone who can pay and/or support their agenda. Any wannabe Ranger cops or agents who climb into those armored tin cans they supply the police with these days, might just as well go ahead and baste himself with butter first. Ask any combat vet about RPG. The simple RPG-7 has been around for at least 50 years and the newer RPG-29 is a monster. Like a kid hiding behind a bush with a 12 gauge, an RPG can certainly ruin anyone’s day. Armored or not. I guess the author has not heard of a false flag attack and architects & engineers for 911 truth.I don’t know who to feel worse for 1) a intelligent person that writs articles like this that doesn’t beleive 9-11 could be a staged false flag event or 2) a person that is so mind controled that the thought would not even enter their being. Military Officers for 9-11 truth, Firemen for 9-1 truth, Scientists for 9-11 truth etc…. probably another 20-30 organizations….back to sleep, zzzzzzz. But Mr Collins, he just needed to do his part to try and recreate a master narrative where Greens are terrorists and nuclear operators are kittens. With the global disaster at Fukushima, we know the authorities are absolutely useless, the Pacific Ocean will soon be unusable. Michael Collins this is a very interesting article you have here. Very interesting that focus is made on San Onofre. Not too many people understand this government is going to blow up San Onofre and blame it on some entity that they themselves have created. They will call it “terrorism”. The plan was revealed via clues left in a Masonic TV show. Government terrorists LOVE to do this, telegraphing their murderous intentions, so they leave clues in the most unlikely places. Good job on the article, I think? Your either a high level Freemason, a government operative, or just very observant. To everybody else, get the hell out of San Diego! Humboldt bay power also has ponds and above ground containers. The insanity is there is no way to move the containers. @John ONeill: Judging from your comments, you are having reading comprehension challenges. The lead photo should have clued you in that we are not talking about 30-year-old bazookas or terrorists planning to hold anything. Five bazooka rounds were launched at a French reactor by a Green party terrorist thirty years ago. No significant damage resulted. It would require something considerably more potent to puncture a spent fuel pool ( thick reinforced concrete fully lined with welded steel). After that the putative terrorists would have to hold the plant till all the water drained – it’s kept twenty feet deep above the fuel.